One Man Tackles Psychotherapy For The Amish Psychotherapist Jim Cates has an unusual clientele: Amish teenagers. At 16, the Amish experience a way of life outside their communities for the first time, and some teens get into trouble. To help them, Cates must adapt his therapy to a fundamentally different culture. 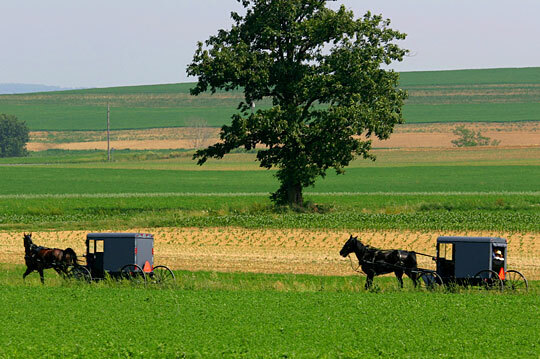 Two Amish carriages passing through scenic farm land during spring planting. There aren't many psychotherapists in modern America with a hitching post in their parking lot — but Jim Cates is one. The hitching post is discreetly tucked in one corner at his Topeka, Ind., office, quiet testimony to the fact that this particular practice is frequented by some very unusual clients. Cates is a psychotherapist for the Amish. Though Cates does have some mainstream American clients, his small country practice in the Amish community of Topeka serves primarily Amish teenagers, most of them kids, as Cates explains it, in the grip of a very particular Amish rite of passage: Rumspringa. For those unfamiliar with the ins and outs of Amish life, Rumspringa is a period in mid-adolescence when Amish teens are permitted to sample — for the very first time — all those amenities that their American peers long ago learned to take for granted. Stuff like television and cell phones and poor fashion choices. The rationale is that after being exposed to the modern world in this way, the kids, who take part in this period at age 16, are in a better position to decide whether or not they want to truly commit to the Amish way of life. Most Amish teens don't do much with this opportunity. Most continue to live the kind of lives we typically associate with the Amish. But some do experiment, particularly with alcohol, which is how they end up sitting in the office of Jim Cates. Cates provides individual psychotherapy and group sessions for teens who have found themselves caught up in the criminal justice system after being arrested for underage drinking. The work he does with teens is court-mandated. Some Amish teens — like some mainstream teens — are fond of drink. Some might even experiment with drugs. But after years of working with Amish teens, Cates says that in important ways, Amish teens are fundamentally different from their mainstream peers. "If I see a quote unquote normal American teenager in my office, they are probably struggling with what do I want to do, who am I, all of these issues that come up in middle adolescence of who do I want to be?" says Cates. But that, says Cates, is not the focus for Amish kids. "What they're going to do is some kind of manual labor, which really doesn't identify who they are; it's just something they do to make money," he says. "If they're going to be Amish, they're going to get married at a young age and stay married for the rest of their lives. So they're not individuating. It's not about 'who am I going to bloom into,' it's about becoming part of a larger group. And that's dramatically different emotionally from what American teenagers do." And, so, Cates has had to adapt his therapy. In fact, he's had to adapt his therapy in many, many ways. Take, for example, one of the most basic elements of therapy: the location where therapy is practiced. Though most mainstream Americans are more comfortable in neutral office settings, the Amish are apparently put off by the impersonality of that kind of environment. They are much more comfortable in their own homes, surrounded by members of their own families. And, so, Cates doesn't have his clients come to him; he goes to them. He says he's done therapy in every conceivable location — in basements; in living rooms surrounded by brothers and sisters and aunts and uncles; even, he says, driving 70 miles an hour up the highway into Michigan. And then there is that small matter of talking about your personal life with a relative stranger. For mainstream Americans the long session of searing self-exploration is practically a right of passage, but the Amish frown on talking about themselves. They are taught to be humble and view self-disclosure as prideful. It's just not part of their tradition. Oddly enough, to get around this, Cates says he has learned to practice a form of feminist therapy with his Amish clients. Basically he tries to get them to talk about the other people in their lives, and he works backward to their own experience from there. Of course the problem of having to adapt a therapy to another culture isn't unique to Cates. There are lots of therapists who work with subcultures that are either unfamiliar with or totally hostile to the practice of mental health. Therapists who struggle with the same kinds of questions that, Cates says, haunt him at the end of the day when he thinks back on his sessions with his clients.
" What was kept from me because [I'm not Amish]. What was gently told to me because [I'm not Amish] and I should have picked up on it and didn't. What was told to me in a different way than they would have told me if I was Amish. I've gotten better at that over time but that's always there. There's always a line in the sand."